Every year over 1 million people flock to downtown Mobile to catch the sights and sounds of Mardi Gras. The Mobile, AL parades have a long heritage as Mobile is the original home of Mardi Gras. Because of this traditional, heritage, and history, Mardi Gras is a special time of the year for Mobile locals. Mardi Gras lets us Mobilians get back to our roots. We get in touch with our past. We’ve been celebrating Mardi Gras in Mobile for over 300 years! That’s a lot of moonpies! At Toomey's Mardi Gras, we're a big part of Mobile Mardi Gras today. We've been serving Mobile Mardi Gras for 40 years. In fact, 2018 is our 40th anniversary! You can help us celebrate by stopping by Toomey's Mardi Gras during Mardi Gras season. We'll be having specials and deals all season long, so be sure to stop by and see us. And if you have out of town guests or visitors, bring them by and show them around our store and wareshouse. They'll be amazed at the vast selection of Mardi Gras throws, masks, toys, trinkets, and beads available here. And be sure to check back on our website www.toomeysmardigras.com for brand new deals and specials. In the following blog post, you’re going to get the top tips for surviving and getting through the Mardi Gras parades in Mobile. This guide is useful for any parade you attend in Mobile, Alabama. These tips have been collected from years – sometimes decades – of attending, riding, and enjoying Mardi Gras parades in Mobile. So be sure to pass it along to friends. Here's the top 7 steps to surviving the 2018 Mardi Gras season in Mobile, Alabama. This is simple and really good life advice in general, but during Mardi Gras it’s your #1 priority. Planning ahead can save you from hours of heartache and can keep a great night from going bad. When you’re at a parade in Mobile during Mardi Gras, you can be certain of two things. There’s going to be a crowd. And the weather can be lovely or, well, not-so-lovely. The first item to plan for is the weather. Check the weather BEFORE you go out. Check it the night before. Then check again in the morning before you leave. This is Mobile weather, so you know it can go from warm and mild to cold and wet in just a few hours. Bring a jacket and/or some rain gear if it’s raining. There is nothing more miserable than being wet and cold during a parade. But next time you go to the parade on a cold night, take a moment and look around. You're almost guaranteed to see people who are freezing cold, rubbing their arms together and stomping their feet on the ground. Why? Because they forgot to plan ahead and bring a jacket! This goes double if you work during the day. You've had a long day at work. You rush to get home and get ready for the parade, get in the car, and get to your spot. You finally get to your favorite spot to watch the parade and then, Boom! You realize you've left your coat at home. It's very easy to walk out the door without a jacket. It's miserable to be at Mardi Gras without the right clothes or jackets. Plan for traffic to and from the parade, staking your claim to your own spot to watch the parade, and, if you're ambitious, know the parade routes so you can catch it more than once. We’ll talk about those in just a minute. But first… let’s talk about food and alcohol. Being Hangry is a real thing. If you get hungry, you get grumpy. And no one should be grumpy during a Mardi Gras parade. Your best bet to prevent a grumpy night is to pack snakcs. The perfect snacks for Mardi Gras are fruits or nuts. It’s an easy (and healthy!) way to stay in a good mood while you’re enjoying your day. If you're a parent bringing kids to the parade – Snacks are a must have! Here are a few ideas you can toss into a bag the night before. Toss in goldfish, cheerios, popcorn, or pretzels. Of if you want to bring fruit, think about grapes, apple slices, or a banana. Since you'll be on the move – small and portable snacks are the best! Don't forget your water along with your snacks. You might not know this, but many times if you’re feeling a little hungry, it’s actually because you’re thirsty. Doctors say that many times hunger pains are the first sign of dehydration. So bring a bottle of water or two for you and the family. Unless of course you’re drinking alcohol, in which case you should drink even more water. That leads us to our next tip. Sitting out on the parade routes all morning, afternoon, and evening can be fun. No wait… It IS fun. If alcohol is part of your day, pace yourself as you go. Everyone wants to have a good time and too much alcohol can hurt the safety of yourself and others. Pacing yourself with your alcohol and drinking plenty of water will make your time at the parade a blast. It’ll also save you from a massive hangover the next day. A good rule of thumb is this: For every cocktail or beer, have a glass of water. And if you get too drunk or go too long without food, then read the next step. If You Need Food, EAT! Someone gets tired, grumpy, or too drunk because they don't eat anything all day. Look, snacks are fine. Drink Water. Pace yourself with alcohol. Do everything you've just read about in the previous steps. please remember to fuel your body and eat something. If you’re in downtown Mobile during the Mardi Gras parades, there’s plenty of places to eat. You’ll find plenty of food stands and there’s dozens of local restaurants within walking distance of your spot. There's probably a crowd, so be patient. If you need to eat, get some food. If you're eating with a group, here's a little tip. This comes after years of eating downtown during Mardi Gras. When the waitress comes around, make a decision on the spot. Don't have her come back to you. The sooner you order, the sooner you'll your food and get back in the Mardi Gras action. This tip is more Mardi Gras advice from a pro. Here it is: Find a spot, stake it out, and stay there. Find a spot and stay there. Camp out. Unload your car. Fold out your chairs. Whatever. But hang around in your area. You can’t wander around like Moses in the desert and then expect to have a good place to stand when the parade starts. The whole point of you planning ahead and getting there early is so you'll ENJOY yourself when the moonpies start flying. If you skip this step, you’ll likely be shoved to the back of the crowd or elbowed in the gut when you try to catch some of those sweet, sweet necklaces from Toomey's. Expect traffic delays getting to the Mardi Gras parade and getting home. If you go to a parade in Mobile, there’s several ways to get in and out. If you’re going to a parade in downtown Mobile, there's only a few ways to get to the parade routes. During the season there's over a million people traveling to downtown Mobile to the parades. And leave early and make sure you know where you’re going. See Tip #1. These days everyone has a camera on their phone. And between Snapchat, Instagram, and Facebook, there's going to be plenty of selfies and photos. Here's the tip – Take MORE! Mardi Gras only comes around once a year. Capture the moment. Take pics of your family. Your friends. Snap up photos of the crowds. The floats. The costumes. Use your phone to take photos of your experience at Mardi Gras. Why do we suggest taking more pictures? Because a picture isn't just a picture. It's a time machine. A photo can instantly transport you back in time to the Mardi Gras parades. It can instantly remind you of fun times with friends. A photo can make you feel like you're back at Mardi Gras whenever you look at them. And since you have such fun at Mardi Gras, it just makes sense to capture all the fun with photos and pictures? So take as many pictures as you can! And can you do us a favor? When you post them, tag Toomey's Mardi Gras in the pictures! We love to see you having fun at the parades. Look. We know that Mardi Gras is exciting . Over a few weeks, more than 1 million people will visit and participate in the parades. There's bound to be a few issues and problems. As the parade goes on, the excitement builds. The crowds gather. The excitement builds. You see the floats coming. And as the floats pass, everyone wants the big beads, the masks, and the stuffed animals. But look – keep this in mind. Mardi Gras is a fun time for everyone so keep The Golden Rule in mind. Quite simply – Treats others like you want to be treated. There's enough treats, beads, and trinkets to go around. You'll wind up with your fair share. It's important to be kind and friendly to your fellow Mobilians. 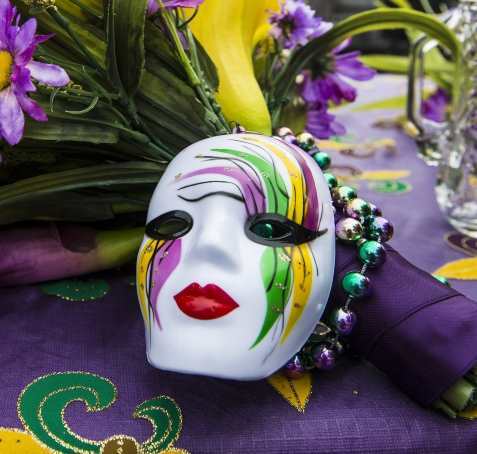 Mardi Gras has a rich history in Mobile and it's a time to celebrate our heritage. So if you get bumped or shoved or someone is a little rude... just shake it off. Follow the Golden Rule – Treat others like you'd want to be treated. Follow this rule and you'll be a great citizen of Mobile, a patron of Mardi Gras, and a wonderful example for all the visitors to our wonderful time. Enjoy yourself and from everyone here at Toomey's Mardi Gras, Let's the good time roll!